Now you have to find a bathroom -- one that is clean, well stocked with soap and hand sanitizer and has a place for your bags other than the floor. It should be easy to find a place to go, but, alas, not all mall and store bathrooms are as inviting as we might like -- shoppers in, shoppers out, all day long. In fact some restrooms are downright disgusting; I've left stores to go home and use my own toilet. "I used to just hold it and not drink as much," says Katherine Chappelle, 36, of Bloomfield Township. Lately, however, she has started using shopper bathrooms -- Nordstrom at Twelve Oaks in Novi and Somerset Collection in Troy -- because she decided postponing the potty is bad for her health. When Elizabeth Robbins, 26, of Dearborn Heights is in "unfamiliar territory" or a mall she doesn't think is all that great, she relies on the bathrooms at Macy's stores. Rita Sitto, 23, of Shelby Township has to consider her shopping partner. "I shop with my mom. ... My mom's diabetic. Diabetics always have to use the bathroom. My mom has no germ phobias or anything," says Sitto, an avid shopper. "I," she adds, "try to consider my best option." I've been talking to shoppers (mostly women, because public bathrooms are especially difficult for female shoppers and in truth, women shop more than men). And in honor of today's official start of the holiday shopping season, I've compiled a list of potties that are devoid of the ick factor that surrounds so many public toilets. Neiman Marcus, Somerset Collection South, Troy. I know a man who leaves Somerset North and walks to Somerset South so he can use the Neiman Marcus restroom, it's just that posh. And rather than stalls with doors and walls that go halfway up to the ceiling, these have full-length doors and walls, making each stall its own little water closet. Saks, Somerset Collection South, Troy. "I usually just go to the second floor. It's always clean. It's always empty," says Carol Ostrowski, a 50-ish shopper who lives in Plymouth. "I like restrooms when they're kind of back off the beaten path. You know there aren't going to be a lot of people heading for them. They're going to be cleaner." Family restroom, Twelve Oaks Mall, Novi. Room for a stroller, kids and a parent. It has two separate toilets -- one adult-sized and one child-sized. "It's always clean. Last time we went at lunchtime, it looked like it'd just been cleaned. The seats were all still up, everything was still spotless," says Maria Mainero, a 38-year-old mother of two small children who lives in Farmington Hills. Lord & Taylor, Lakeside Mall, Sterling Heights. "I try as much as possible to stay away from public bathrooms," says Sitto. But when she's shopping -- Lakeside is her usual destination -- she opts for the Lord & Taylor restrooms. "I will definitely do all I can to get there," she says. "I feel the more upscale the store is, the cleaner the bathroom might be. It might be a stereotype, but if the clothes are that expensive, the bathroom will be clean." The Mall at Partridge Creek, Clinton Township. They're new, they're clean, and the women's bathrooms have a nice shelf for purses. Home Goods and Target, everywhere. Reliable, clean enough and seldom short of toilet tissue. Macy's, everywhere. Not the poshest in town, not the worst. They're nicely dependable. Nordstrom, everywhere. A tough critic, Chappelle is a fan of the restrooms at Nordstrom at Twelve Oaks Mall in Novi. (I can vouch for the women's restrooms at other Nordstrom stores.) Not only are they clean, "I'm an interior designer, so the space is nice. There's nice wall covering. There's a lounge with seating," Chappelle says. Van Maur, Laurel Park Place, Livonia. Nice, clean, upscale. The ladies' lounge has comfy furniture and a phone for local calls. Panera, Baja Fresh, Biggby Coffee. Rather than use a store's icky bathroom, Ostrowski says, "I'll leave and go to Panera. ... And I know fast food-wise, Baja Fresh always has very clean bathrooms." Other good bets: Starbucks and Biggby. Somerset North and South, Troy. "They're all clean," says Trisha Geftos, who is 29 and lives in Riverview. "They have the hand dryers that are extremely fast, they're the super ones where ... they dry your hands in 5 or 6 seconds." Indeed, the bathrooms near the mall's Peacock Café food court are testing new state-of-the-art superfast hand dryers by Dyson. Family restrooms, Southland Center, Taylor. Large enough to accommodate a stroller and a couple of kids and equipped with rocking chairs for nursing moms or anyone else who needs a break. Contact GEORGEA KOVANIS at 313-222-6842 or gkovanis@freepress.com. That's cool, but even cooler is that we seem to have enough of a presence now in metro Detroit to merit these sorts of slightly random notes about us. Nice! Ah yes! the lovely "throne"! And a clean one at that! From the vibrant colors and pictures on the walls to the emaculate sink and, of course, the foaming hand soap!!! Now the choice is yours between dryer and towels but either way Biggby bathrooms add a wonderful yet discreet touch to the great atmosphere! I am glad to see the Metro Detroit has taken a liking to our commode! 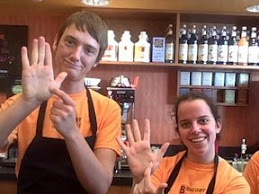 Tara Michener visits BIGGBY COFFEE! 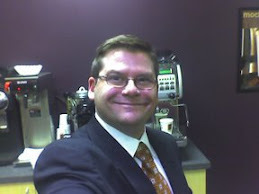 In search of the BIGGBY WAY? Making one new friend everyday!